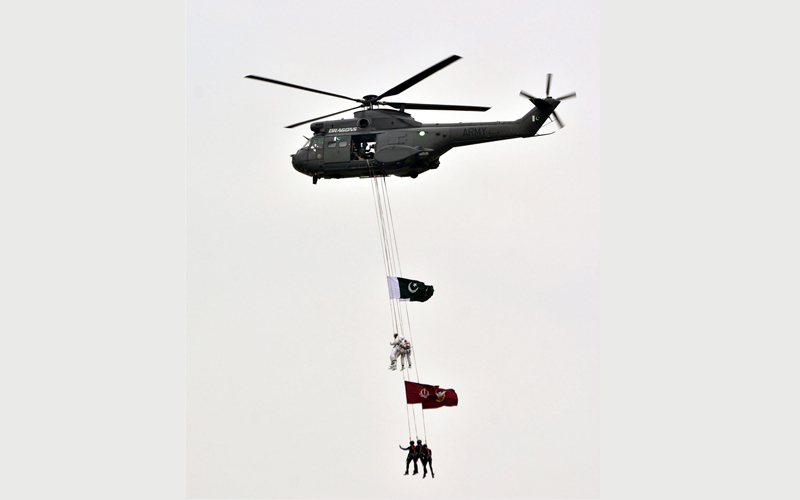 A spectacular display of military prowess and professional excellence took place at the Parade Ground near Shakarparian as part of the countrywide celebrations to mark the 79th Pakistan Day. The day holds a significant place in the history of Pakistan and to mark it in a befitting manner, the armed forces went ahead to hold the parade despite tensions on the borders. A very powerful script with important messages by a team of commentators led by Lieutenant Colonel Malik Shafiq Awan of the Inter-Services Public Relations (ISPR) moved the audience. To commemorate the occasion, the ISPR has also prepared a national song: Dil Dil Ki Awaz, Har Dil Ki Awaz – Pakistan Zindabad. President Dr Arif Alvi was chief guest at the ceremony, while Malaysian Prime Minister Mahathir Mohamad, who arrived in Pakistan on a three-day visit Thursday, was the guest of honour. The country’s top civil and military leadership, including Prime Minister Imran Khan, Chairman Joint Chiefs of Staff Committee General Zubair Mahmood Hayat, Chief of Army Staff (COAS) General Qamar Javed Bajwa, Chief of Naval Staff Admiral Zafar Mehmood Abbasi and Chief of Air Staff Air Chief Marshal Mujahid Anwar Khan were present at the parade. Bahrain’s Commander of the National Guard Lieutenant General Sheikh Mohamed Bin Isa Bin Salman Al-Khalifa, Azerbaijan’s Minister of Defence Colonel General Zakir Hasanov especially came to attend the ceremony. Special hallmark of the parade this year was the participation of paratroopers from Azerbaijan, Brunei, Bahrain, Kingdom of Saudi Arabia and Sri Lanka. Contingents of Azerbaijan and Saudi Arabia were part of marching columns while troops from Turkey and China participated in aerobatics. The air chief, who led a fly-past, saluted the president from the cockpit of the F-16 plane. Following him, a formation of four JF-17 Thunder fighter jets exhibited aerial manoeuvres, displaying the professional excellence of Pakistan Air Force. Similar daring feats of different aircraft, including Mirage and F-7PG were also held. The sky of Islamabad became lively when a Chinese aerobatic team with six J-10 fighter jets appeared and completed a series of manoeuvres, emitting colourful smoke in the air to leave the mark of Pak-China friendship. Breath-taking feats by the Turkish aircraft, done with extreme professionalism, were also a treat for every eye. Another main feature of the parade was a march-past, held by the contingents of armoured and mechanised infantry. The Al Zarrar tanks, Armoured Personnel Carriers (APC), Al-Khalid Main Battle Tank and artillery howitzer guns were paraded right in front of a large number of audience. Similarly, radar systems, unmanned aerial vehicles (UAVs), cruise missiles and other state-of-the-art weapons were also rolled out on the occasion. The last segment of the ceremony was a stunning display of paratroopers getting off the helicopters in parachutes and landing on their specified destinations in front of the audience. Skydivers from the three armed forces as well as from Azerbaijan, Sri Lanka, Bahrain, Brunei and Saudi Arabia exhibited their skills in this segment. The Special Services Group sky divers made free-fall jumps from a height of 10000 feet. This year participating troops included foot columns of Pakistan Army, Pakistan Navy, Pakistan Air Force, Frontier Corps KP, Pakistan Rangers Sindh, Islamabad Police, Tri-Services Lady Officers, Tri-Services Armed Forces Nursing Service, Girl Guides, Boy Scouts, Special Services Group from three services, mechanized columns of Armoured Corps, Mechanized Infantry, Artillery, Army Air Defence, Engineers, Signals, Army Strategic Force Command and mounted columns of Camel Band and Presidents Body Guard. Contingents of the Defence Security Force and Mujahid Force participated for the first time.